A Tuesday night crash has left a motorcyclist in Chelmsford with very serious injuries. Responding officers first got a call just after 7:00 about a motorcycle lying on the ground in pieces at High Street and Acton Road. When officers got to the scene they discovered the injured motorcyclist as well as an SUV that had been involved in a collision with the motorcyclist. The motorcyclist was suffering from very serious injuries because of the crash. He was transported to Lowell General Hospital with life-threatening injuries. The SUV driver was not injured and cooperated with police on scene. The speed limit in the crash area is 25 mph, but there is no word on what caused the collision. Police continue to investigate the crash. The motorcyclist has not been immediately identified except as a 21 year old man from Lowell, Massachusetts. Motorcycles are dangerous vehicles. While they may offer the thrill of a fast ride or attention of other motorists, too many times a motorcycle accident can be fatal. 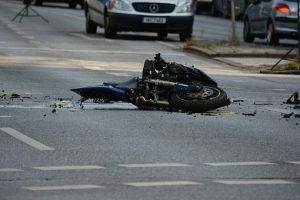 Motorcycles obviously do not have the protection of an outer frame, leaving the motorcycle rider vulnerable to serious injuries in the event of an accident. Unfortunately, this case illustrates some of the dangers faced by motorcycle riders. Although we do not know who is responsible at this time, it is clear that the motorcyclist got the worst of the crash. Motorcyclists should always take as many safety precautions as possible, including wearing helmets as helmet use may be the difference between life or death in a motorcycle accident. If you or a loved one has been injured in a Massachusetts motorcycle accident, please contact us a soon as possible. At the Law Offices of Jeffrey S. Glassman, we have extensive experience in motorcycle accident cases. We know the strategy behind these cases and how to present them in such a way as to give you the best chance of recovery. If you have suffered injuries, you deserve compensation. Don’t let the insurance company treat you unfairly. In order to maximize the value of your case, it is important to hire an experienced and dedicated attorney. We are ready and waiting to assist you today. Please call our Boston office at 617-369-2900 for a free consultation to speak with a member of our team.